The Campaign for the Accountability of American Bases (CAAB)  have continually monitored the planning applications made by the Ministry of Defense Land Agent (Defence Estates’ Organization, Catterick Garrison - on behalf of the US Government) for Menwith Hill to Harrogate Council for over 10 years. 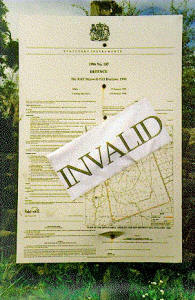 Planning applications are submitted to Harrogate Council for information only, they have no power of veto. It may, however (if it receives sufficient objections) initiate proceedings which may lead to a public enquiry. In 1996 CAAB learned that a significant development was to take place at MHS. "HMG [Her Majesty’s Government] and the United States Government are pleased to announce that the European Relay Ground Station (RGS-E) for the new Space Based Infra-Red System (SBIRS) will be established at RAF Menwith Hill. The RGS-E will provide additional relay capability of SBIRS, and its establishment at RAF Menwith Hill will capitalize on the existing infrastructure. HMG welcomes the opportunity to strengthen US/UK co-operation in this field. SBIRS is the world-wide satellite-based system providing early warning of ballistic missile launches. It has been developed to upgrade the ageing US Defense Support Program (DSP) satellite system. Construction will include a one-storey 10,000 square feet concrete and steel building adjacent to and architecturally blending with the existing building. 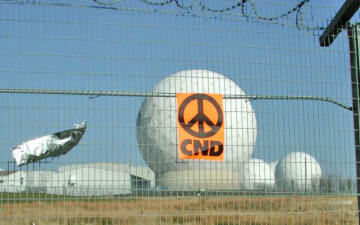 Up to four new radomes approximately 60 feet in height and similar to the existing radomes will also be required. Local planning consent will be sought in the usual way." 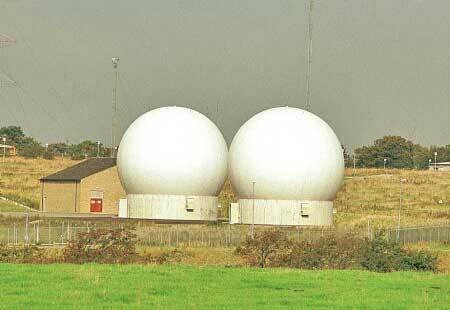 Menwith Hill would soon be the home for the European Relay Ground Station for the New Space Based Infra Red System . Our SBIRS system consolidates DoD’s non-imaging infrared systems that fulfill national security needs in areas of missile warning, missile defense, technical intelligence and battlespace characterization. It consists of high and low components. We need to get SBIRS High on-orbit first as a replacement for the Defense Support Program (DSP). We’re going to put four satellites up to replace four DSPs. This will improve our location identification and tracking capabilities by better identifying the missile launch point, impact point and azimuth. It will also give us another level of refinement in those areas as we work the missile defense issue. The advantage of SBIRS Low is that it can track "cold bodies" in space. SBIRS Low is important for the ballistic missile defense systems. With SBIRS High, you can only track infrared signatures which means the rocket motor has to be burning. These systems will significantly improve our ability to provide much more precise launch and impact point of theater missiles to forces in a theater of operations. They are key to our ability to cue systems that we’ll use for active defense as part of both theater and national missile defense." In December 1998 the Star Wars role of MHS was further exposed on television by Richard Sadler  and in October 1999 Lindis Percy of the Campaign for the Accountability of American Bases made an application for a Writ to stop this construction. Squadron Leader Humphrey Vincent - RAF Liaison officer. The American Base Commander successfully claimed immunity from UK court proceedings under the "Visiting Forces Act". The other defendants contested that the claim be struck out on the grounds of ’Abuse of Process of the Court’. However, the High Court decided the Claim should be heard. Eventually however, President Clinton’s decision on 1 September 2000 to leave the fate of the NMD programme to his successor, forced CAAB to withdraw the writ after all . The First Defendant is now claiming £16,173.06p costs and the 2/3/4 Defendants are claiming £11,000 costs against Lindis. 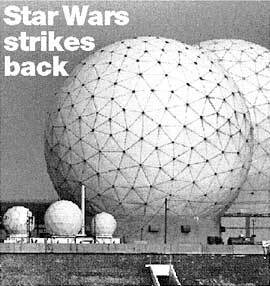 However, CAAB will still continue with this action, and Fylingdales was later included in the Claim as another base to be used as part of ’Son of Star Wars’ . On 18 January 2000, Ann Cryer (Bob Cryer’s widow) now also a Member of Parliament, made a speech in the House of Commons that highlighted the US Space Command’s vision to be "Masters of Space" . Now - with the election of George W Bush to the US presidency and the appointment of Dennis Rumsfeld as Secretary of Defense - the US development of a Star Wars (or National Missile Defense) program is almost certain. Menwith Hill’s role in these plans is well recognized - the debate and protest continues . Two radomes for SBIRS  were in fact built even before the US gave notice to withdraw from the Anti-Ballistic Missile Treaty with Russia. 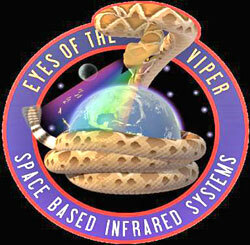 However, the SBIRS High infrared detection system has become one of the US Defense Department’s biggest white elephants - the SBIRS-High Increment 1 software was finally installed at Buckley Air Force Base in Aurora, Colo., almost two years late, but the satellites themselves are plagued with problems involving the infrared detection system. There is no doubt that, through its communication, relaying and eavesdropping capabilities, Menwith plays an important role in helping the US military in its plans to dominate and control space, despite the effects on International Treaties (such as the ABM Treaty, the Outer Space Treaty and the Non Proliferation Treaty) and the mistrust and concern expressed by people and their governments all over the world . The US military has described space-based intelligence collection as a “key force-multiplier for future military operations”. The objective is to enable the US military to deliver "precise military firepower anywhere in the world, day or night, in all weather". Intelligence collection is the foundation for war planning. Together with high-resolution satellite imagery, signals intelligence played a vital role in identifying military targets in Iraq. Signals intelligence was used to identify key Iraqi military command, control, communications and intelligence facilities that became priority targets for the US offensive. 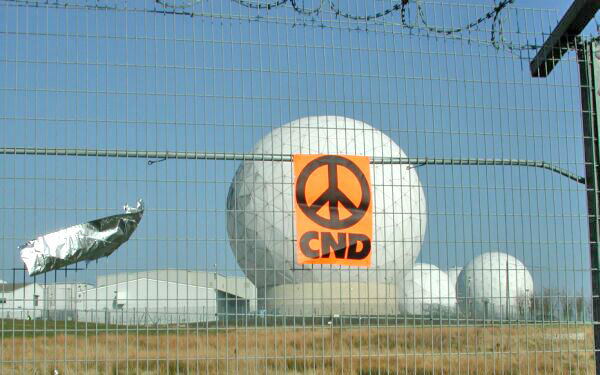 Australian personnel at Pine Gap and UK personnel at Menwith Hill were intimately involved in these processes. "A Soviet-built TALL KING radar that abruptly resumed operation Sunday morning, July 29, in southern Iraq gave US analysts their first substantive warning that the Iraqi invasion of Kuwait was likely." "US electronic listening posts - including AWACS, intelligence ships, and ground stations - have been somewhat successful in monitoring Iraqi military communications. But much of the Iraqi army has been using underground cables to communicate between Baghdad and Kuwait. SIGINT was also central to efforts to attack Iraqi leadership assets, including Saddam Hussein himself. Following the controversy that surrounded the bombing, "some political leaders pushed to release intercepted radio signals from the site,"  but this never happened. American skepticism concerning Iraq’s offer on15 February to withdraw from Kuwait, subject to a number of conditions, was reinforced by signals intelligence. Terrified Iraqis were certain that the devastating explosion signaled the beginning of the ground war, and turned on their air-defense radars all along the boarder. American pilots pinpointed many air-defense installations they never new existed. According to Professor Des Ball of the Australian National University, during the Gulf War satellites controlled by Menwith Hll’s sister base at Pine Gap intercepted Iraqi communications and radar signals. 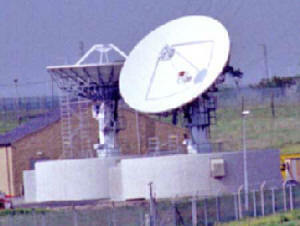 These satellites monitored critical communications channels within Iraq, including those used by the Iraqi military high command. Satellite systems were a key component to the execution of the war on Iraq. During the war the US military was using 10 times the satellite capacity that it used in 1991. Nine days before the start of the war in 2003 a new US Defense Satellite Communications System was installed in space to connect ground forces, ships, planes, the Pentagon, the White House, the State Department and the U.S. Space Command. The director of space operations for the US Air Force, Maj. Gen. Judd Blaisdell, has estimated that 33,600 people at 36 sites around the world are involved in space-war activities. There were problems with the technology. At least 2 Tomahawk missiles missed their targets and landed in Saudi Arabia and Turkey by mistake, but also the availability of radio bandwidth (the range of frequencies that can be used) was found to be insufficient. On Tuesday 22nd April 2003 the US Air Force set up the 614th Space Intelligence Squadron at Vandenberg Air Force Base in California. "Everybody in the world has been watching this Iraq war, and the Gulf War before that," said Lt. Col. White in an interview after the ceremony. "And they know what space does for the U.S. military. Opposition to the base has been active since the 1950s. Most of what we know about the base has been put together from various sources by Duncan Campbell. One important source of information has been that obtained from within the base by peace campaigners and from their continuous observation and vigilance. There have also been demonstrations, peace camps, non-violent blockades, trespass, questions in parliament, letters to the press and radio and TV coverage. 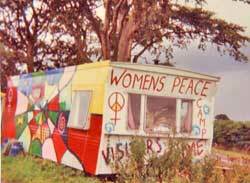 A mixed gender weekend peace camp was originally set-up by Otley Peace Action Group (OPAG - played a major role in raising public awareness and protest at MHS in the 1980s) on 29 April 1983 . At least 10 other weekend mixed peace camps were held at MHS by other local peace groups. This eventually led to the setting up of the permanent mixed peace camp in July 1984 , which existed for three and a half years until 1987. The campers provided a focal point for disseminating information about the base to members of the public. A spectacular silver moonbow on the night of 30 January 1994 inspired the name ’Moonbow Corner’ for a second campsite on the more visible SE corner of the base alongside the major A59 road. In May 1994 a ten day "Amazon Festival" was attended by over 100 women - despite the rain there were many excursions onto the base. On the last day the sun shone and 6 women stayed on to set up the full-time "Womenwith Hill" peace camp. Frequent arrests for fence cutting, slogan painting inside the base, blockades and a visible protest outside together with lots of local, national and international media attention, meant that an eviction was inevitable. The acquisition of a large mobile home and the laying of gravel paths and flower beds further demonstrated the women’s resolve to stay, consequently the North Yorkshire County Council (NYCC) Highways’ Authority obtained a County Court Possession Order for Moonbow Corner and the Camp was evicted on 18 April 1995 . 7 women chained to vans were arrested (although all charges against them were later dropped) and mounds of earth & rocks were dumped to prevent re-occupation. However the women had already anticipated the eviction and had moved onto a lay-by ¼ mile to the east. The Kettlesing Head lay-by on the A59 proved to be an even better site for visitors to call and park. The camp grew to 10 caravans, becoming well established with plenty of local and international support. There were dozens of arrests for blockading and 33 women awaited trial for trespassing contrary to the byelaws. 18 peace camp women have served prison sentences for actions at the base and many more have been detained. The Legal Department of the NYCC started proceedings to recover its land and prevent the establishment of any other peace camps by the women peace protesters on 26 November 1997 . On the grounds that the Women’s Peace Camp constituted a danger to the public by being a distraction to motorists using the A59 highway, and that the camp was an unlawful incursion onto land belonging to the Highways Authority. On 22 June 1998 , at the High Court in Leeds, Mr Justice Hooper found the camp to be unlawful and injuncted three women, Anne Lee, Helen John and Jenny Gaiawyn not to reside overnight on the site, nor in the vicinity of Menwith Hill. The Highways Authority went back to the High Court on 29 October 1998 to seek a Possession Order for the lay-by land. The hearing was adjourned to allow for new Human Rights legislation to be taken into consideration. The judge ordered that the camp site be cleared of all but one token caravan. The women complied with the High Court Order & removed nine caravans & all equipment from the site on 27 November 1998 . At the hearing on 5 February 1999 it became evident during cross-examination that the NYCC had withheld documentary evidence of its collusion with Menwith Hill Station. Mr Justice Hooper ordered the disclosure of all relevant correspondence. Documents thus disclosed revealed that the eviction of the Women’s Peace Camp had been instigated by the Menwith Hill authorities. Squadron Leader Ted Sumner, RAF (acting as Liaison Officer for the US National Security Agency) met with Mike Masterman from the NYCC Environmental Management Department (of which the Highways Authority is part) on 23 September 1996 . At that meeting Menwith Hill’s complaints against the camp were discussed, as were ideas on how to evict the peace camp without appearing to involve the station authorities. If the NSA were seen to be interfering with the right of UK citizens to demonstrate, would be embarrassing and politically damaging. The women continue to maintain that their right to protest in the way they choose, by living outside the base, is enshrined in the European Convention on Human Rights (embodied in The Human Rights Act 1998) and by recent legal precedents. The judge recognised that they have a serious and credible cause and on 14 July 1999 allowed the women the right to occupy the lay-by with an Alternative Information Centre during the day (from 7am to 11pm every day) but not to stay over night. The women are currently raising funds for a vehicle and they still keep up a regular presence there . More details of their campaign can be found through newsletters and on the internet. One way of challenging the legality of the base (and gaining publicity about what goes on there) is through the courts. Court actions (involving fence cutting and trespass in particular) have been used repeatedly by campaigners to bring important issues to light. "This was simply an administrative change to bring the base into line with other RAF sites made available by the Ministry of Defence to the United States Government" . 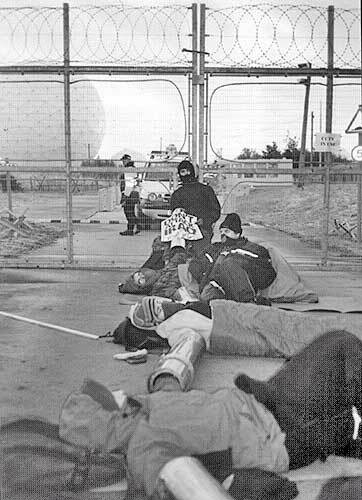 The Military Land Byelaws were first brought in as a reaction to the protest against Cruise missiles at Greenham Common in April 1985 by the then Secretary of State for Defence, Michael Heseltine. The intention was to make trespass a criminal offence and therefore arrestable and so women could be criminalised to stop their actions of resistance. Over the years many hundreds of women were arrested, detained, convicted and imprisoned under these byelaws. On 12 July 1990, after a four year journey through the courts, starting with the Newbury Magistrates and ending in the House of Lords, the byelaws were held to be ’ultra vires’ - outside of the Minister’s powers - and, so, ’ab initio’ - from the beginning. 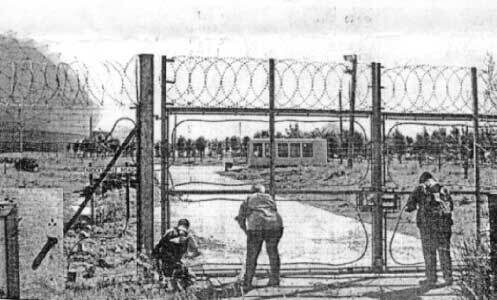 The Greenham byelaws were adjudged to ’interfere with the rights of common’ and so did not affect the status of the byelaws at similar bases. The HMS Forest Moor and Menwith Hill Station byelaws came into force in 1986 and the first challenge to Menwith Hill in the courts arose out of a number of arrests made under the military byelaws. The case against Lindis Percy and John Bugg was heard at Ripon Magistrates’ Court in 1991. The ruling by Mr J. Barry  (the Stipendary Magistrate) that the onus of proof of the validity of the byelaws was on the Prosecution not the Defence, was appealed to the High Court by the Director of Public Prosecutions. The High Court appeal was heard on 31 July 1992 and the Judgment by Woolf and Pill  held for the first time that the byelaws at HMS Forest Moor and Menwith Hill Station were invalid. Later, as a result of the ruling, some people had their convictions quashed, and costs were awarded at York Crown Court. The Woolf and Pill Judgement enabled many people to enter MHS without risk of arrest during the three years it took before new byelaws were drafted. 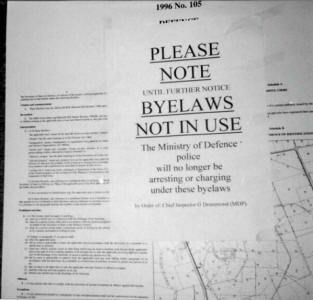 In July 1991 the Ministry of Defence Police at MHS stopped arresting under the byelaws and trespass again reverted back to a civil offence. In the mean-time, in 1991 , the Secretary of State for Defence (then Tom King) tried to sue Lindis Percy for trespass and claimed damages for £11,600 for ’wasting police time’ at Menwith Hill. This was the first injunction at Menwith and started as a temporary injunction and lasted for five years before being made permanent in 1996 . On 28 August 1991 Mr. Justice Cresswell transferred the case from the High Court, where the plaintiffs had started it, to the Harrogate County Court, and from there it was transferred to York (as the facilities at Harrogate were inadequate). Eventually it was heard by Judge Crabtree  in York County Court in July 1993 . Judge Crabtree ruled reluctantly (after an application made by the Secretary of State for Defence) that the case should be sent back to the High Court. In his ruling Judge Crabtree said that if Ms Percy was right in her defence it would have meant that all the agreements and arrangements between the US and British Governments would have to be renegotiated. When the case eventually came to the High Court in March 1995 , Malcolm Rifkind put on a Public Interest Immunity Certificate , to prevent documents obtained from inside MHS (to prove that the NSA was in occupation) from being submitted and the case had to be conceded. It was also revealed that the land was compulsorily purchased at the request of the US. Among the secret documents disclosed were details of the ’security of tenure’ agreement which allowed the Americans use of the land for 21 years renewable every 21 years on request of the USAF. There were also details of how bases should be referred to as ’RAF’ and not USAF. 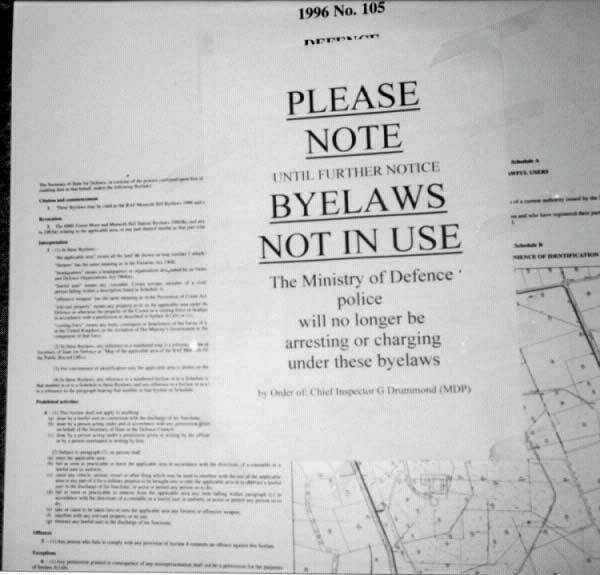 The byelaws story became tangled when Lindis Percy, John Bugg and Rachel Greaves brought out a Writ against 66 Ministry of Defence Police officers and others for unlawful arrest and detention under the 1986 invalid byelaws. John Bugg died in 1993 after meticulous and significant work challenging military land byelaws. Lindis Percy and Rachel Greaves lost the case after the MOD successfully challenged the Woolf and Pill ruling, which resulted in the 1986 byelaws being declared valid again. An appeal to the House of Lords by Lindis Percy and Rachel Greaves against this ruling could not be pursued because legal aid was denied. This resulted in the somewhat farcical situation whereby the people who had had their convictions quashed should have technically been found guilty again! "have indicated that there are defects in the military lands byelaws at HMS Forest Moor, Menwith Hill, RAF Alconbury and Greenham Common. Byelaw notices are no longer displayed at these establishments." Although the 1986 byelaws were reinstated by the High Court in 1993 the Ministry of Defence Police were reluctant to use them. 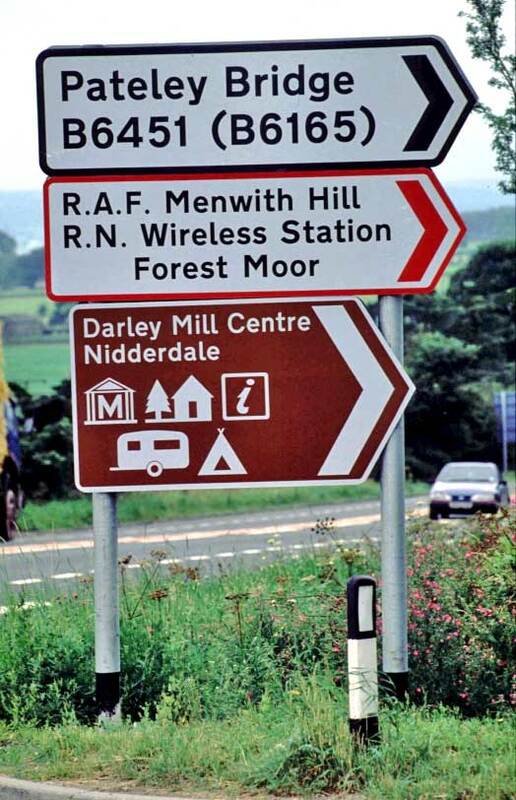 The Secretary of State for Defence, Michael Portillo, signed new byelaws on 19 January 1996 when the station became ’RAF’ Menwith Hill and Squadron Leader Edward Sumner was appointed "RAF Commander". The new byelaws came into effect on 19 February 1996 and the day after Lindis Percy was arrested and charged under them. 5 days later Helen John and Anne Lee (two women from the Women’s Peace Camp) entered the base and called at the home of the US Base Commander, Colonel G Dickson Gribble. They refused to leave and were arrested for trespass, contrary to the new byelaws. that the byelaws signed by Mr Portillo were made in "bad faith"
On 4 September 1996 at Harrogate Magistrates’ Court they were convicted by Stipendary Magistrate Mr Neville White and sentenced to 2 years conditional discharge. The defendants appealed to the Crown Court and obtained witness summonses for the Prime Minister (John Major), the Secretary of State for Defense (Michael Portillo), the Home Secretary (Michael Howard), the ex-Secretary of State for Defence (Malcolm Rifkind), the US Base Commander, the "RAF Commander" and the chief executives of British Telecomm, Mercury Communications and Vodaphone. However, none of these actually ever appeared in person. 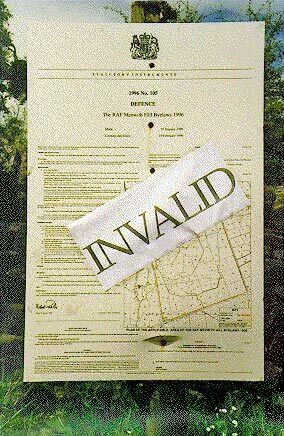 Eventually, on Friday 5 September 1997 Judge Crabtree  at York Crown Court upheld the appeal and judged the military byelaws invalid because they took in land which was not being using for military purposes. Evidence extrapolated by Duncan Campbell from BT’s letter to the court, showed that the base is now capable of sending back to the US two million intercepts per hour, this could be a fraction of the total number of intercepts made - only those thought to be of further interest are passed on. The judge accepted that probably the Interceptions of Telecommunications Act was being violated, as it is unlikely that the Home Secretary can issue two million warrants per hour! The judge also condemned BT for revealing confidential arrangements made with the NSA for the connection in 1992 of 3 (now 4) digital optical fibre cables - capable of carrying more than 100,000 telephone calls and other messages - to Menwith Hill. In the same court case Tony Benn MP (formerly Secretary of State for Energy and responsible for the UK Nuclear Power program) testified that Britain is under contract to the US to buy nuclear weapons on the condition that bases like Menwith are allowed to operate from here and on condition that the US controls and has access to all British intelligence operations. The Ministry of Defense appealed against the 1997 Crabtree decision and this appeal was upheld on 22 January 1999 in the High Court, London, by Judges Buxton and Collins . They should have sent the original Appeal against MHS byelaws convictions by Anne Lee and Helen John (Menwith Women’s Camp) back to the Crown Court to be dismissed and to have both women’s convictions re-instated . After losing in the High Court, the two women notified the Ministry of Defence lawyers that they did not intend to appeal to the House of Lords, but wished to introduce a new line of argument in the lower courts (to examine the powers granted to the Defence Secretary under the Military Lands Act, 1892 - it would be an abuse of process to use an Act of Parliament for a purpose for which it was not intended). Following the Crabtree ruling, in April 1998 , Lindis Percy was found to be 9 times in breach of the terms of her permanent injunction at Menwith Hill by Judge Carnwath  in the High Court for the unlawful use of the footpath i.e. taking down the declared invalid byelaws signs. "I cannot conclude that her stance was wholly untenable." "What cannot be constitutionally acceptable, in my view, is for the Executive to proceed as though it were simply free to disregard a decision of a competent court with which it does not agree...", he went on to say, "...there was no legal justification for the retention of the byelaw notices; it is an abuse of that power, and therefore unlawful, to put up or maintain notices of bye-laws which are known to be invalid." Judge Carnwath reimposed a six month suspended prison sentence over one year as from that date. 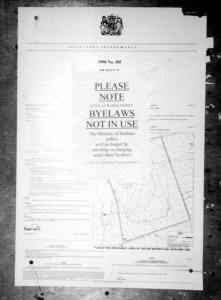 Despite this, byelaws notices were still put up around the base. This did not stop the action against the byelaws, however. 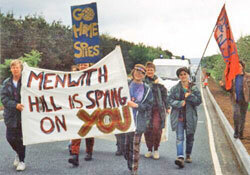 In 1999 Lindis Percy was found ’in contempt of court’ for being in breach of her permanent injunction at Menwith Hill and sent to prison for 9 months for continuing to pursue her actions against the byelaws. After her release from prison at the end of July she continued to challenge the byelaws by walking on a corner of the base. In September 1999 the Crown Prosecution Service discontinued all outstanding pre-appeal byelaws charges (74 cases against 35 women). "I am not prepared to prosecute you for the purposes of providing a test case under the byelaws …" . So, now on the one hand the Ministry of Defence Police (MDP) insist that the byelaws are valid and in force - on the other hand they are refusing to charge peaceful ’trespassers’ who are in breach of them. There seems to be a deliberate policy by the MDP to prevent cases coming to court, thereby denying the citizen the right to challenge the validity of the byelaws again. Former CND chair Buce Kent flanked by Chrisitne Dean and Lindis Percy at the Menwith Hill base during the "Independence FROM America" protest on July 4th 2000. 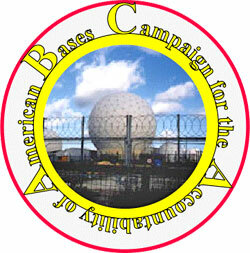 July 4th demonstrations organized by the Campaign for the Accountability of American Bases (CAAB) have become an annual event at Menwith Hill - see reports for 1999 , 2000 , 2001 and 2002 also see details for the 2003 demonstration . On 13 December 2000 (the night George W Bush was confirmed as President) Anni Rainbow and Lindis Percy were arrested for obstructing cars leaving Menwith Hill at the Main entrance. One month later Lindis was also charged with a ’racially motivated’ offence under the Crime and Disorder Act for allegedly ’trailing the US flag on the ground - forcing an American to drive over the flag’. She was also charged with a similar offence under the Public Order Act (minus the ’racial’ element). However, ten days before the trial was due the Crown Prosecution Service discontinued the ’racially aggravated’ charge. After a three day trial, on 27 April 2001 , Anni and Lindis were found not guilty of ’obstruction of the highway’. Peter Nuttall, the District Judge, ruled that they were not on the public highway as the area was judged to be part of the ’applicable area’ of the Military Land byelaws and they were therefore on private land. Lindis was also cleared of the Public Order Act offence and the court heard that Ministry of Defence Police had sent emails to US personnel on the base asking if they had found it insulting that she had stood in front of traffic holding a US flag with ’STOP STAR WARS’ written on it. "We would not be here if it was not for a highly politically motivated prosecution - some might say with the support of the American military". "We do have rights as citizens and they include the right to protest. Nobody could say that this was other than peaceful protest". The District Judge (Patrick Heley) ruled that there was no breach of the Human Rights Convention (Article 10 and 11). He made it clear that there was a balance to be made between the right to protest and the rights of the Americans to be protected from insult and abuse of their symbol. Lindis was fined £200 for the Public Order offence, £100 for ’obstruction of the highway’ and ordered to pay £250 costs. Lindis had also expressed criticism of the decision of the court and how his ruling effectively decided in future what symbols would be acceptable in any peaceful protest. As a result she was later fined £250 for being ’in contempt of court’. She will be appealing the decisions of Patrick Heley . The byelaws cases have provided an unprecedented opportunity to expose the connivance of the UK State Legislative/Executive/ Judicial structures with the Pentagon in support of US bases in the UK. On 24 February 1999 Menwith Hill was featured on Channel 4 Television in the UK by the comedian and political activist/commentator Mark Thomas . 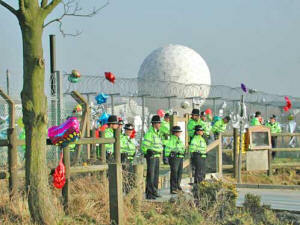 The show included a balloon ride over Menwith by Mark and his team and an overt "surveillance" of the American Embassy in London. 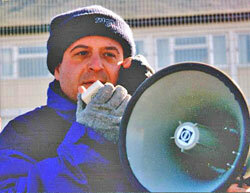 Mark Thomas was also master of ceremonies on 26 October 1998 when Privacy International presented the first ’Big Brother Lifetime Achievement’ award to Menwith Hill. At the same event Lindis Percy of CAAB was awarded the ’Winston Lifetime Achievement’ for her continued campaigning against Menwith Hill and similar bases in the UK. Demonstrations and protest actions at the base continue. 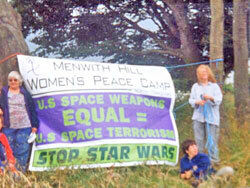 On 19 June 2000 (the 3rd anniversary of the US Department of Defense submission of plans for SBIRS) Anne Lee, Helen John and Angie Zelter from the Women’s Peace Campaign were arrested by MoD police after breaking into the base (through the new high-security, alarmed perimeter fence erected to protect the new developments) to highlight the vulnerability of the base to terrorist attacks and to oppose the use of the base for "Star Wars" . In August 2000 Anne Lee had her bail varied to allow her to take a local government watchdog to see the rare orchids growing at the base and she filed a complaint against the local council, accusing them of being negligent over conservation of the orchids. This site has always been known as an area which contained fauna and flora of special scientific interest - a wetland site - and the fight to preserve the rare flowers had been going on since the 1980s when Hazel Costello of OPAG contacted Harrogate Naturalist Society to preserve the site. Anne Lee had raised the issue of the preservation of the orchids in July 1998 . In fact, the construction of the perimeter security fence towards the end of 1999 had been held up for nearly a year while an expert on orchids from the Royal Botanic Garden in Edinburgh (Dr Richard Bateman) inspected and assessed the flowers in bloom in a corner of the base . The MOD (on behalf of the Americans) were forced to reroute the fence-line so as to avoid damaging the orchid reserve. The trial of Helen John, Anne Lee and Angie Zelter took place on 30, 31 October and 15 December 2000 . The defendants admitted their action, stating that it was justified because the fence has been erected to protect Echelon & Star Wars and that, if the owners of the fence (the UK government, i.e. the British people) were aware of the crimes it is designed to conceal, they would approve of the defendants’ act. The women were able to present evidence to justify their action - this included showing the TV programmes ("The Hill" produced by Duncan Campbell in 1993 and "Uncle Sam’s Eavesdroppers" produced by Richard Sadler in 1998 ) and a great deal of recently published material. In summing up, District Judge Browne stated that it was incumbent on the defendant to prove that this was their state of mind at the time the act was committed - however, the ’burden of proof’ is on the prosecution to prove otherwise. The judge ordered a re-trial and on 3 May 2001 all three were found guilty District Judge Alderson said she would insist on a custodial sentence for the £962 of damage  and the women were in fact sentenced on 21 May. Helen John and Anne Lee were given three and two months imprisonment respectively. Angie Zleter was not sentenced as she was not present in court and a warrant was issued for her arrest. At that time Helen John had declared herself an independent candidate in the General Election standing against Tony Blair in his Sedgefield constituency on a "No Star Wars" platform. The sentences were unusually harsh as in cases of this kind the English and Scottish courts would normally impose a fine relating to the amount of damage. If peace protesters refuse to pay on grounds of conscience, the courts would then sentence them to a term of imprisonment which, in England, would be two weeks for damage under £500 . Judge Alderson said she believes that the women believe they acted in the best interests of society, and to protect society but they had broken the law and she was giving a harsh sentence because she wanted to deter Helen, who had 32 previous convictions, and Anne, who had four. However, both women said they would go on campaigning at the base - in fact Helen was amused by the idea that a prison sentence would serve as a deterrent when such an important issue was at stake . In 2000 the Women’s Peace Camp also referred a large catalogue of complaints about the base to the Local Government Ombusdsman. 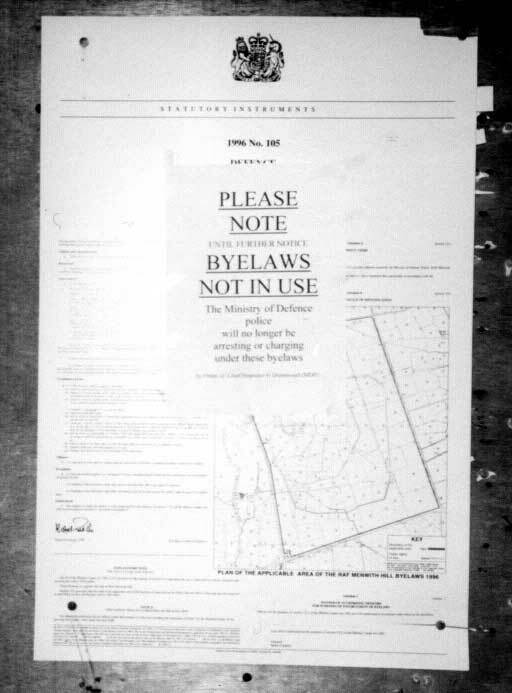 Included in the submission was material to evidence that the ’Star Wars’ developments were going ahead without the approval of the UK Parliament, that ECHELON activities contravened national and international laws and that considerable environmental damage had been effected by the base (including a detrimental impact on the Orchid Reserve). However, the Ombudsman stated that she had no authority to deal with any of these complaints and recommended that a case against the Ministry of Defense be taken to the Parliamentary Ombudsman. 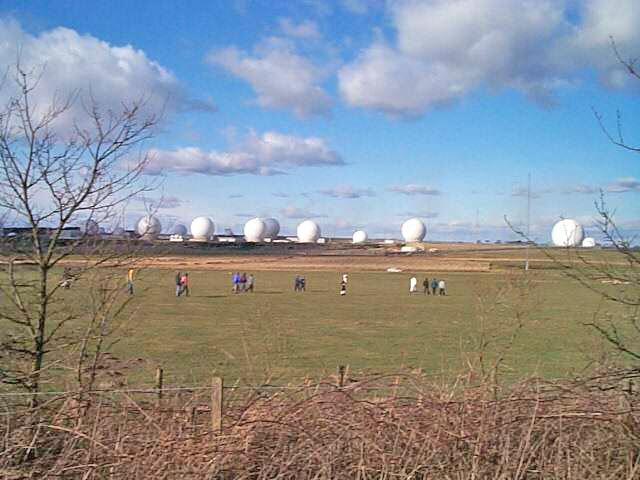 This is further confirmation that there is no official oversight of any of Menwith Hill’s activities. 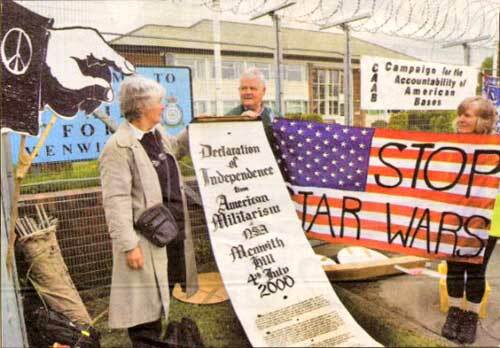 In May 2001 a small international demonstration (along the road outside the main base - much restricted due to the foot and mouth epidemic around that time)  was held as part of the Global Network Against Weapons and Nuclear Power in Space Conference against Star Wars and its Annual General Meeting, which was hosted by Yorkshire CND in Leeds. The Conference included speakers and workshops on Menwith Hill and its role in Star Wars and also on Echelon . 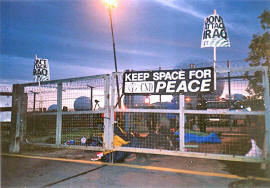 Peace protesters blockaded the base for 5 hours on 24 October 2002. Despite being given Aggravated Trespass notices, no arrests were made and the protesters left with their locks and banners in hand. The protesters blocked the only two working entrances to the base and, whilst the police managed to open a small farm gate to allow some traffic in, vehicles had to cross two fields in order to enter the base proper. Only essential staff were allowed in to the base today – all contractors were turned away. 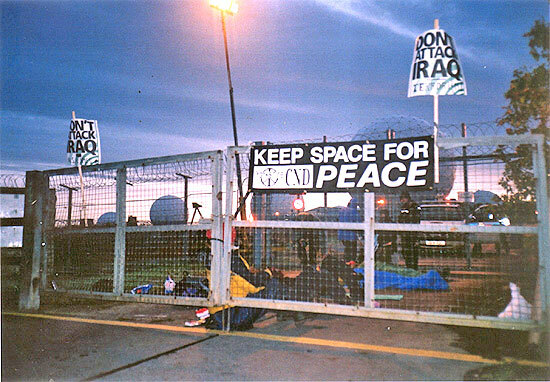 The non-violent blockade by an independent group of protesters was an attempt to shut down the base as it prepared for the war on Iraq war. The blockade aims to disrupt work to pinpoint potential targets in Iraq currently taking place within the base. Menwith Hill’s main entrance was closed off at the time for ’essential maintenance work’ by concrete blocks and razor wire. Using D-locks, Tripods and chains the protesters blocked the two side entrance gates (Nessfield gate and Steeplebush gate on the B road off the A59) being used whilst the repairs take place. By blocking the entrances just before the next staff change-over the protesters stopped the work of the base in very real, practical terms, and in doing so, stopped the base’s war preparations. See report and item from ’The Guardian’. On 12 December 2002 the Women’s Peace Campaign organized a "Embrace the Base" women only demonstration to remember and celebrate the empowerment of the 30,000 women who demonstrated against the USA’s Cruise Missiles at Greenham Common in the same day in 1982. 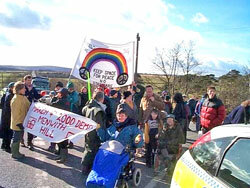 On 22 March 2003 over a thousand people joined a ’Foil the Base’ protest against the bases involvement in the war on Iraq. Despite a massive police presence many people entered the base and there were 12 arrests (most released without charge). On 4 July 2003 about 400 people joined a ’Gatecrasher’s Ball’ demonstration calling for "Independence From America" protest against the bases involvement in the war on Iraq. Despite a massive police presence many people entered the base and there were 12 arrests (most released without charge). Mark Thomas was Master of Ceremonies once more suitably dressed for a Ball. Unfortunately there was a heavy police presence and some unpleasant scenes - see ’CAAB report . The Campaign for the Accountability of American Bases (CAAB) continue to hold weekly demonstrations on a Tuesday from 7-9pm outside the base in all weathers and throughout the year.